Written By: Tracy Letts, based on his own play. Starring: Matthew McConaughey, Emile Hirsch, Juno Temple, Thomas Haden Church, and Gina Gershon. William Friedkin doesn’t pull any punches with his Southern gothic drama Killer Joe about the low-lifes of the world. It takes only three minutes for him to shove a woman’s under-parts right in Emilie Hirsch’s (and our) face. Well that’s why this film comes with an NC-17 rating, I thought, though justifications will continue throughout. But Friedkin, who has never shied away from explicit and horrific images (The Exorcist, Cruising), and doesn’t just do it for indulgence. Killer Joe is set among indulgent people, with little care or self-worth. And they must be punished, and Friedkin has just the man to do it. Working once again with playwright Tracy Letts (the two last collaborated on Bug), Friedkin brings a purported intensity to a stage play with Killer Joe, this one anchored by a truly manic and truly brilliant performance by Matthew McConaughey. The actor has of course been on a run with a string of oddball yet highly unique performances in films like Bernie and Magic Mike, but Killer Joe takes the cake for the actor’s sheer magnetism and silence. He’s introduced in the film like a Tarantino character—we see the gloves, the shades, the gun, and the cowboy hat. Back when it was originally staged in Chicago, Michael Shannon donned the role. Shannon’s a terrific actor, but he’s also known for his big ferocity. What makes McConaughey so thrilling is his utter silence. He doesn’t let words run through his mouth without valuing every syllable. McConaughey, who plays the titular character, however, doesn’t come into the film for about thirty minutes, which teeters between tar-black comedy and all out horror. We first meet the North Texan Smith family, who want to plan a murder for money. There’s Chris (Hirsch), the dumb son with the “brains,” a very loose term, behind the matter. There’s Chris’s father Ansel (Thomas Haden Church), who might have a little more brains than Chris, but certainly less conviction. There’s Ansel’s wife, Sharla (Gina Gershon), an annoyed hick who’s willing to get in the score. And there’s Ansel’s other child, Dottie (Juno Temple), who may be twenty years old, but for all intensive purposes, has the mind of a twelve year old. The hit? Ansel’s first wife and Chris and Dottie’s mother, Adele, who has a life insurance policy for fifty grand. So enter Killer Joe, a detective who also performs murder and performs it well. The problem is that Joe demands the money up front, and when Chris and Ansel explain their situation, Joe instead demands a “retainer,” as he calls it, in the form of Dottie. Blood thus begins to boil. 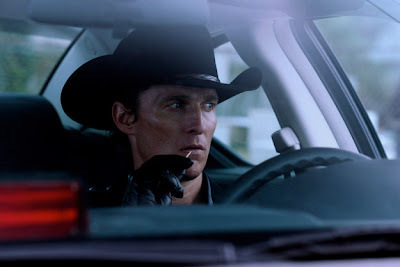 Killer Joe meanders around its plots through various scenes, some that feel a bit disconnected to the main action (notably a subplot involving Chris’s gambling habits and owed money), but always brought back home by McConaughey’s centering power. If the rest of the characters may just be caricatures (and deliberately so), McConaughey is in so deep, so buried that you can’t take your eyes off him, even when he decides to perform so very horrific acts. Friedkin does his best to move the action around and give it and “open” up the play, but his best work is in these close, claustrophobic sequences around dinner tables. During a late scene, a character suddenly pushes someone to reveal a bit of information that will change the entire alliance. Friedkin suddenly cuts against the 180 degree line, flipping the way the characters were framed next to and away from each other. And then it doesn’t let go from there. Some of the moments in the last section of Killer Joe are certainly shocking, and certainly tough to watch. Not just for the violent content, but the way Friedkin doesn’t shy away from it. His camera has a haunting objective presence to it, and shows no sympathy for the depravity on display. By the time the film explodes into intense violence in its final minutes, Friedkin has justified every action to lead to such a bang of an ending, making the climax appropriately jaw dropping. He may not leave us with too much to chew on, but the technique on display is simply impossible to ignore. We’ll always be left with McConaughey’s haunting eyes—somewhere between human and monster, letting us into his soul, and down into the true darkness of humanity.